Mushroom Model Publications (MMP) is located in the U.K. All their books are printed by their associate Stratus in Sandomierz, Poland in the English language. Stratus also publishes their own books in Polish. This book is soft-bound of 144 pages in 7" x 10" page format. 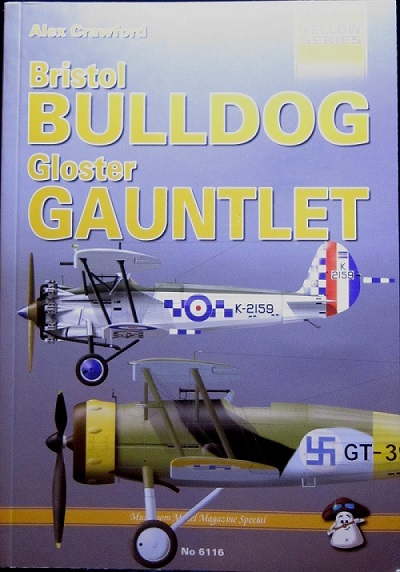 It is the story of two of Britain’s most successful and popular inter-war (1930’s) fighter aircraft. It contains a complete and comprehensive history of the development and service of both types. amounting to 31 side profiles, six 2-views and one 3-view. Also included is a plan drawing of 4 fuselage internal bulkheads. There are 41 black and white photos of the Bulldog. There are 46 walk-around color photos of Bulldogs preserved in museums. There are 17 color side profile paintings of the Bulldog and three 4-views. Also there are 10 color paintings of upper wing patterns. Chapters are on the Bulldog in Foreign service: Australia, Denmark, Estonia, Finland, Japan, Latvia, Spain, Siam and Sweden. There are five 1/72nd scale profile plans of the Gauntlet and 2 are 4-views. Chapters of the Gauntlet in Foreign service are about: Denmark and Finland. 21 black and white photos of the Gauntlet are included. Color profile paintings of the Gauntlet number 9 and another 3 are 4-views. Included are color paintings of 6 upper wing patterns for the Gauntlet. There are 30 color walk-around photos of Gauntlets in museums and 12 illustrations out of tech manuals. Information charts in the book number 3. There is a 4 page appendix at the back of the book. This is a neat book and it will be of interest to both aviation historians and modelers alike. I want to thank the folks at Casemate who sent me this sample and Dr. Roger Wallsgrove Editor-in-Chief of MMP for this book.